Eating healthier and being more active are the cornerstones of better living. It seems pretty simple, but the reality is that it takes effort to live a balanced life, day in, and day out. Stress, lack of time, extensive to-do lists, family and social obligations, and more all make it difficult to stay on track. But if you’re actively trying to lose weight, gain muscle, or just make better choices in general, creative meal-prepping strategies like these can help. Meal prepping involves cooking extra servings of foods like lean proteins and vegetables so you can eat healthy meals throughout the week. It’s a great way to ensure you have well-balanced lunches at work too, instead of grabbing some fast food. When people hear meal prepping, they think no variety – just bland pieces of chicken breasts and steamed broccoli in plastic containers – but the reality is that you can get creative with meal prepping. Plus, you’ll save money by eating in more. When preparing your chicken, tofu or other lean protein, use aluminum foil dividers on your cooking pan so you can season three different ways. One section can be flavored with Cajun seasoning, the other can be a thyme-and-rosemary blend, while the third divider can be seasoned with Jamaican Jerk. By dividing your cooking pan, you can still prepare a large amount of food, but have variety in taste. So Monday, you can pack a Cajun-seasoned chicken lunch while Tuesday can be more Jamaican-inspired. The week after, try other seasonings, rubs or sauces. Vegetables are a must in your diet. They’re full of vitamins and nutrients, water and have very little calories. Plus, they’re so colorful, making meals more appetizing. Get creative in the way you meal prep your veggies. 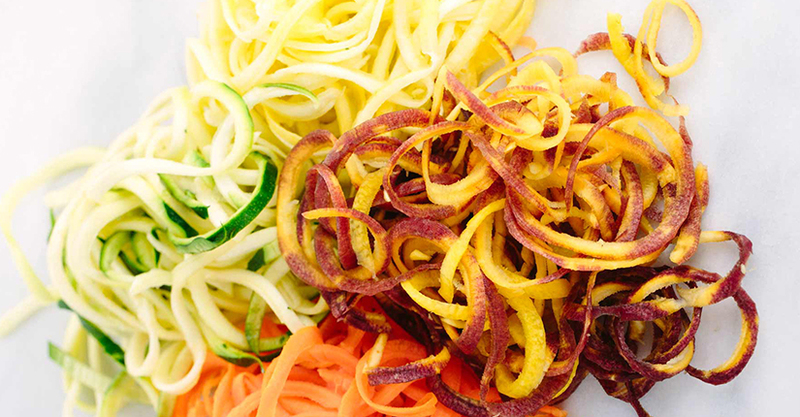 The latest trend is to spiralize your vegetables including carrots, zucchinis (have you heard of zoodles? ), beets and more. You can also chop them for a basic cucumber-tomato-onion salad that can be added to any meal you’re having. Or go traditional, just roast a huge batch of veggies with some olive oil and portion them out. Roasting them allows their natural sweetness to come out. Refrigerate and enjoy throughout the week. They say breakfast is the most important meal of the day, and after fasting all night (getting your REM sleep), it’s crucial that you “wake up” your metabolism. Since mornings can be busy, meal prep your breakfast the night before. 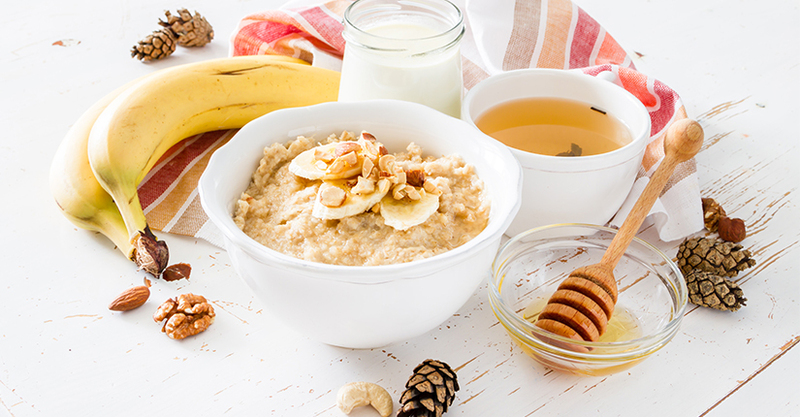 Fiber-rich oatmeal is a great breakfast that’ll keep you satiated until lunchtime. You can prepare overnight oats it in a mason jar, put in all of your ingredients like dried fruit, milk and nuts, and let it rest in your fridge. In the morning, you’ll have a grab-and-go healthy breakfast. You can also meal prep for smoothies. When you do your grocery shopping, purchase fresh fruits that you can place in individual bags and store in your freezer. In the mornings, all you have to do is drop a few pieces of frozen fruits with protein powder and milk, and you’ve got a fresh smoothie. Mix and match protein-rich foods with vegetables, fruits and other items like hummus in plastic containers. You can also make no-bake snacks and store in plastic bags for quick grab-and-go options like protein energy balls. Healthy snacks include carrot sticks and cheese, Greek yogurt, turkey slices and celery sticks, apple and peanut butter and even protein bars that you can quickly pack. Meal prepping helps you stay on track and reach your fitness goals more easily, encouraging your routine while delivering a healthy dose of nutrients throughout your day.